How are you doing, there Superwoman? Progressing fast on your career path, nurturing a marriage or trying to have a relationship, taking care of the baby or kids, household chores, keeping track of the finances, doing homework with the kids and taking them to their extra-curricular activities and appointments, yes, the list is endless especially for a working mothers. With so much to do at home and work, most of the women feel overwhelmed and stressed out. And you start wondering if a balance is even possible. Sensible career oriented women of today are realizing that it’s no longer about a high salary and more about balance in life. Being a working mother myself, I do understand that making choices and defining healthy boundaries can be a challenge, but it is essential to maintaining personal and professional equilibrium. As we all need more choices, freedom, and certainty about what we can achieve and experience in our life, we must strive to achieve balance in all the areas of our life that matter to us the most. I have tried out many things to maintain balance in my own life. 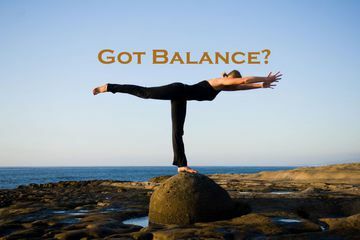 Let me give you some ideas to help you maintain balance in your journey. When you realize the purpose for which you are born, you are able to reach beyond the surface meaning of your life and find your deeper answers. And finding your passion is a crucial step in gaining momentum in your life and unleashing the power within. Just dig in deeper to find out what really matters to you. If you follow your heart and let passion be your drive, you can make work your play and play at your work. To be truly complete as a person, one who is inwardly aware and outwardly successful, one must focus on mastery in all the four dimensions of life - physical, mental, emotional and spiritual. And one of the beauties of life is that it drives us to constantly expand and grow in all these dimensions. When you feed your mind, body and soul with positive fuel like nutritious food, quality sleep and exercise, you are able to rejuvenate yourself on consistent basis. You can nurture yourself in many different ways such as by doing what you truly love, through yoga, prayer and meditation, musical or artistic expression or spending time in nature. When you are able to differentiate between the things, you can control and the things you can influence and the things you cannot control or influence, you are able to set your boundaries effectively. And by having a realization of your limitations and constraints, you feel more in control. Adding routines and structure into your life that support your mind, body and spirit is one of the best ways to create and maintain balance in your life. Create your series of daily practices and determine to follow them consistently. Goal setting and prioritizing your commitments are essential elements for planning your day in advance. To stay focused on the things that matter, you need to make time for reflection, time for thinking about your values, priorities, and where you are heading. When you ask yourself what’s important, you can discover what changes are required to make time for the important things. By prioritizing value over volume and sharpening your focus on tasks that truly matter, you drastically improve the quality of your life. Creating opportunities for down time and rejuvenation intentionally can help us maintain balance in our life as our bodies are hard wired for rest and rejuvenation. You must learn to live your own life as a series of sprints – fully engaging for some period of time, and then fully disengaging and seeking renewal before you let the challenges confront you again. The renewal time is the time of self-discovery, reflection, expanding your consciousness and broadening your perspectives. This is a time to take a deeper look at who you are and who you are becoming. Exercise is the most powerful thing that you can do to reverse the aging process and to experience the flow of vital energy. You must exercise regularly to cultivate the perfect health that lies deep inside the temple of your body. The secret of longevity, super energy and serenity is nothing but an exercise regime that you can cultivate in your life. If you want to feel better, have more energy and perhaps even live longer, exercise is the only answer to all such wishes. You must make a conscious decision to start each day in a state of gratitude, focussing on all the good in your life. Take time to acknowledge your efforts and celebrate your achievements and progress for the day. By living in a state of gratitude and you’ll tap into an ongoing source of energy. Celebrate Life - Take time out to love, laugh, learn, forgive and enjoy life to the fullest. Derive pleasure from the beauty of nature, listening to music, reading the scriptures, poetry and many such interesting things. Do what you love – be aware of where your strength lies and what you enjoy doing. Find ways to do more of such things and less of what wear you out. When your actions and priorities are aligned in a way that you are taking care of what matters to you, you feel in balance. There are various benefits you receive when you are in a state of balance. Work more productively and get more accomplished, leading to greater career success. Improving relationships with family and friends.